format-value Signal which allows you to change how the scale value is displayed. A Gtk.Scale is a slider control used to select a numeric value. To use it, you’ll probably want to investigate the methods on its base class, Gtk.Range, in addition to the methods for Gtk.Scale itself. To set the value of a scale, you would normally use Gtk.Range.set_value(). To detect changes to the value, you would normally use the Gtk.Range ::value-changed signal. Note that using the same upper and lower bounds for the Gtk.Scale (through the Gtk.Range methods) will hide the slider itself. This is useful for applications that want to show an undeterminate value on the scale, without changing the layout of the application (such as movie or music players). Gtk.Scale supports a custom <marks> element, which can contain multiple <mark> elements. The “value” and “position” attributes have the same meaning as Gtk.Scale.add_mark() parameters of the same name. If the element is not empty, its content is taken as the markup to show at the mark. It can be translated with the usual ”translatable” and “context” attributes. Gtk.Scale has a main CSS node with name scale and a subnode for its contents, with subnodes named trough and slider. The main node gets the style class .fine-tune added when the scale is in ‘fine-tuning’ mode. If the scale has an origin (see Gtk.Scale.set_has_origin()), there is a subnode with name highlight below the trough node that is used for rendering the highlighted part of the trough. If the scale is showing a fill level (see Gtk.Range.set_show_fill_level()), there is a subnode with name fill below the trough node that is used for rendering the filled in part of the trough. The main CSS node gets the ‘marks-before’ and/or ‘marks-after’ style classes added depending on what marks are present. If the scale is displaying the value (see Gtk.Scale :draw-value), there is subnode with name value. orientation (Gtk.Orientation) – the scale’s orientation. adjustment (Gtk.Adjustment or None) – the Gtk.Adjustment which sets the range of the scale, or None to create a new adjustment. Note that the way in which the precision is derived works best if step is a power of ten. If the resulting precision is not suitable for your needs, use Gtk.Scale.set_digits() to correct it. position (Gtk.PositionType) – where to draw the mark. For a horizontal scale, Gtk.PositionType.TOP and Gtk.PositionType.LEFT are drawn above the scale, anything else below. 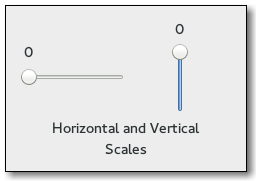 For a vertical scale, Gtk.PositionType.LEFT and Gtk.PositionType.TOP are drawn to the left of the scale, anything else to the right. If markup is not None, text is shown next to the tick mark. To remove marks from a scale, use Gtk.Scale.clear_marks(). Removes any marks that have been added with Gtk.Scale.add_mark(). the Pango.Layout for this scale, or None if the Gtk.Scale :draw-value property is False. Gets the Pango.Layout used to display the scale. The returned object is owned by the scale so does not need to be freed by the caller. Obtains the coordinates where the scale will draw the Pango.Layout representing the text in the scale. Remember when using the Pango.Layout function you need to convert to and from pixels using PANGO_PIXELS() or Pango.SCALE. If the Gtk.Scale :draw-value property is False, the return values are undefined. Sets the number of decimal places that are displayed in the value. Also causes the value of the adjustment to be rounded to this number of digits, so the retrieved value matches the displayed one, if Gtk.Scale :draw-value is True when the value changes. If you want to enforce rounding the value when Gtk.Scale :draw-value is False, you can set Gtk.Range :round-digits instead. Note that rounding to a small number of digits can interfere with the smooth autoscrolling that is built into Gtk.Scale. As an alternative, you can use the Gtk.Scale ::format-value signal to format the displayed value yourself. If Gtk.Scale :has-origin is set to True (the default), the scale will highlight the part of the trough between the origin (bottom or left side) and the current value. Signal which allows you to change how the scale value is displayed. Connect a signal handler which returns an allocated string representing value . That string will then be used to display the scale’s value. If no user-provided handlers are installed, the value will be displayed on its own, rounded according to the value of the Gtk.Scale :digits property. Here’s an example signal handler which displays a value 1.0 as with “–>1.0<–”.